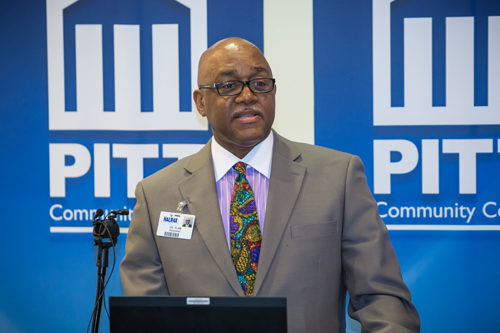 WELDON, N.C. – Halifax Community College (HCC) participated in a press conference with three other community colleges on March 22 at 10 a.m. The event was focused on the N.C. Community College Systemâ€™s (NCCCS) state budget priorities for the 2017-19 biennium, including a program that could save state taxpayers money. 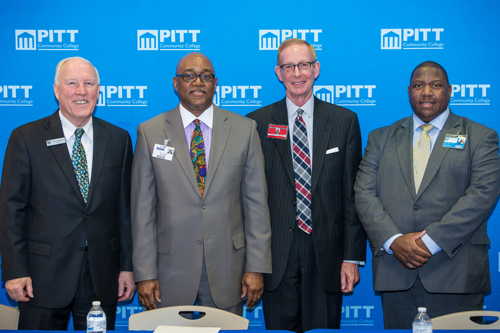 The event, which was held in the Craig F. Goess Student Center on the campus of Pitt Community College, featured four community college presidents from the stateâ€™s Northeast Prosperity Zone addressing the media. In addition to HCC president Dr. Michael A Elam, presidents from Pitt, Martin and Roanoke-Chowan community colleges participated. Elam focused on student completion and success, with current funding requested for $22.6 million. While addressing the media, Elam said, "This initiative is asking for $30 per student. Our goal is to ensure that any student who wishes to finish their degree will not be hindered because of transportation or personal issues. This funding will allow our community colleges to move students beyond completing classes â€“ they will move to completing degrees and beginning careers." Included in NCCCS budget priorities is increased funding for services aimed at supporting student completion and short-term training programs that quickly lead to better jobs. For PCC, that would mean $782,251 for student support services and $528,786 for short-term training programs. "One of the ways I believe students benefit from completing their degree with HCC is it gives them the opportunity to receive scholarship dollars because they have proven that they did not just start, but completed," said Dr. Barbara Hasty, vice president for student services and enrollment management at HCC. "Completion with good to great grades is key to almost getting the next two years free. For our students who go directly into the workforce, when they complete a credential, the employer knows he is getting an employee who does not just start something, he completes it. In addition, the individual may or may not work outside of the community; however, he will spend most of his money where he lives. I consider this an investment in our community." NCCCS is also seeking funding to encourage college transfer. The money would go toward scholarships for community college students who complete associate degrees before moving on to a North Carolina four-year college or university, public or private. If approved, students would receive a $2,500-scholarship per year for up to two years as long as they maintain satisfactory academic progress. An N.C. Guaranteed Admission Program Report states that North Carolina taxpayers would save $8,000 for each student incentivized to start at a community college rather than a UNC institution.